Diet - Drinking tea, coffee, red wine or other food and drink with strong colorings. 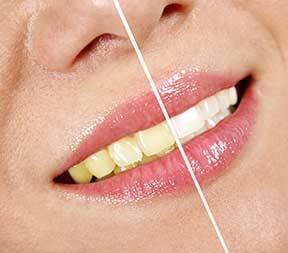 Smoking - Smoking can result in teeth appearing a yellowish color. Age - As people grow older their teeth can become darker naturally. Tooth decay, fillings and tartar build-up can cause discoloration. Trauma - Teeth have nerves and blood vessels inside them. If these nerves and blood vessels are damaged the tooth may become darker - even several years after the trauma. Medication - Staining can be caused by diseases or medicines. Tetracycline, an antibiotic, will cause a distinct discoloration if given to a child whose adult teeth are still developing. This means that the color of the teeth is lightened by placing a whitening solution on the outside of the teeth. This is also known as "laser" or "power" whitening. We will put a rubber seal around your teeth to protect your gums. Then, the whitening gel is painted onto your teeth and a special, bright light is pointed at them. This light speeds up the whitening process. The procedure takes one to two hours. Please see the Whitening Gallery to see the types of results we can achieve with whitening procedures.